Pheasant for sale. Buy online at Zingerman's Mail Order. Gourmet Gifts. Food Gifts. Pheasant might traditionally be the poor man’s holiday centerpiece—without money to buy meat, a pheasant could be hunted wild and dressed at home. 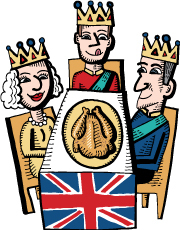 But it’s also a popular choice for the British royal family to serve for dinner on Christmas eve. I understand why—pheasant tastes like the most flavorful chicken you’ve ever tasted, and then some. The flavor is rich and robust, without being gamey. It’ll make for a meal you’ll be talking about for many Christmases to come. A whole pheasant is about the size of a chicken and roasts to a perfect golden-brown in about as much time.